Clusters of scented, creamy-white flowers appear at the ends of the branches from late summer, and long after they have fallen, the pinkish-red calyxes often remain colourful, deepening to rich burgundy as they age. When not in flower the deciduous leaves are attractive in their own right. Lustrous green and deeply veined, they hang in elegant pairs along the branches, usually become tinged with claret before they fall. 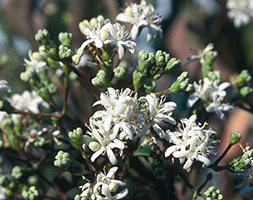 A member of the honeysuckle family, this multi-stemmed shrub or small tree is loved by butterflies and makes a stylish and unusual addition to the garden.